Business coach who ran in the city’s first ever marathon talks to RBTH about how goal setting and focus brings about results in sports and the corporate world. On a cold and cloudy Sunday morning, when the roads of the Russian capital wore a deserted feel, Victor Salamatov, like a few thousand other Muscovites, ran in the city’s first marathon. Conditions were far from ideal in the city, where autumn has well and truly set in, but there was a determination on the minds of many of the capital’s residents who saw the run through. 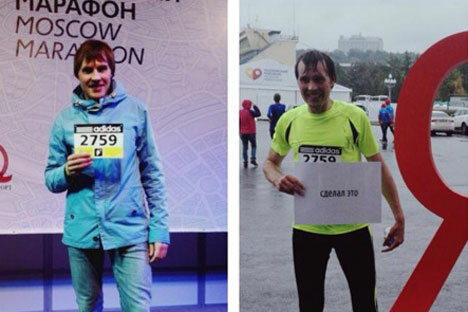 As the pain of more than 41 kilometres caught up with him, Salamatov, put in one final burst as he raced on the athletic track of the famed Luzhniki stadium to complete the Moscow Marathon. “It’s all about unlimited human potential, setting goals and overcoming challenges,” says the 30-year old, who ran his first marathon in an impressive 3 hours and 47 minutes. Salamatov, a professional coach, runs his own executive coaching and leadership development firm. He works with private and corporate clients, varying from Russian state-run organizations to small and very successful businesses as well as major international firms. The concept of business coaches originated in the United States and famous life coaches like Jack Canfield, author of the ‘Chicken Soup for the Soul’ series and Robin Sharma, author of ‘The Monk Who Sold His Ferrari’ and ‘Lead Without a Title,’ also coach corporates. In Russia, however this is still a new and novel concept that is just beginning to become acceptable for organisations. In this way, long-distance running and business have a lot in common, he says while adding that the core element that binds them and brings success is goal-setting and the ability to overcome challenges and find inner and outer resources for that. Setting a goal for a finish time between 3 and a half and 4 hours, he finished within that range. “Whether it’s running or business, you have to make measurable and precise goals,” says Salamatov. He stresses on goals with corporate clients setting guidelines such as when, how much time resources the client can invest. “It makes you think differently,” he says. Essentially business coaches work on setting the goals with clients and the follow through process to seeing them through and help overcome challenges that they face along the path. Business coaches usually work in an organisation from the top management to lower level managers to help set organisational goals, clarity in terms of personal career development and organisational development. “Self development is unlimited,” says Salamatov, who has scaled Mount Elbrus (5642 metres above sea level), the highest peak in Europe, and recently climbed Mount Lenin (7,134 metres above sea level) in the border of Kyrgyzstan and Tajikistan. But long-distance running was a new area for him. “There is always scope for improvement in life as well as in business,” Salamatov says adding that the biggest corporate growth comes from constant improvement and innovation. Russians have a tendency of thinking big and aiming for the cosmos. Such attitudes helped the country win the Space Race and send he first man and woman into orbit. But what is often lost in the country is the ability among many decision makers to carve out small steps to reach the bigger goals. Running marathons according to the business coach is as much about taking responsibility for and control of a current situation. Many Muscovites complain about the weather, the lack of running facilities or even a non-sporting culture among those who are not professional athletes. But more than 7,000 enthusiastic participants turned up in the early hours of Sunday morning to run in the marathon. With a renewed focus on sports in Russia as living standards improve, the country looks set for fresh thinking both in healthier lifestyles as well as in professional and corporate attitudes.